Overview - After making such American noir classics as The Naked City and Brute Force, blacklisted director Jules Dassin went to Paris and embarked on his masterpiece: a twisting, turning tale of four ex-cons who hatch one last glorious heist in the City of Lights. At once naturalistic and expressionistic, this melange of suspense, brutality, and dark humor was an international hit and earned Dassin the Best Director prize at the Cannes Film Festival. Pulling off a great criminal heist takes meticulous planning, careful attention to detail, steadfast patience, a strong team of collaborators, a visionary leader, and an ample amount of ingenuity and skill. Oddly enough, crafting a great cinematic heist flick happens to require all of those same ingredients as well, and Jules Dassin's 1955 classic, 'Rififi,' features them all in spades. A highly influential piece of crime genre moviemaking, the picture is essentially the prototype for all subsequent efforts, helping to engineer the basic formula that Hollywood has been following ever since. And despite the vast number of imitators, it remains one of the most perfectly executed heist films ever made. After being released from prison, a middle-aged thief, Tony le Stéphanois (Jean Servais), meets up with his old colleagues, Jo and Mario (Carl Möhner & Robert Manuel), for one last heist. The trio plan to rob a jeweler's safe and team up with an Italian safecracker, Cesar (the director himself, Jules Dassin), to get the job done. After meticulous preparation, the group enacts their seemingly perfect plan, but complications soon arise after the burglary, putting the criminals and their loved ones in danger. 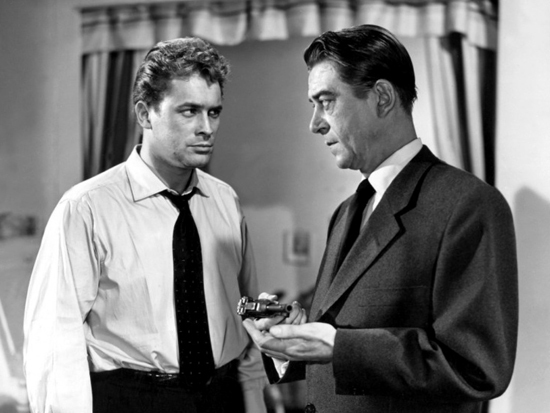 With noir influenced visuals and hard-boiled dialogue, Dassin instantly establishes an absorbing mood that slowly pulls the audience into the characters' dangerous world and methodical planning. Each member of the team is given a distinct personality, and together they hash out all the necessary steps to make sure that their heist goes down without a single hitch. This special attention to detail, coupled with the understated yet still striking aesthetic, gives the movie a unique blend of realism and slightly heightened style that never truly sensationalizes the crime. This approach is no better evident than in the film's famous and much celebrated heist sequence. The extended scene showcases the criminals breaking into the jeweler's office in painstaking detail -- and in a startling decision, the entire segment goes down without a single line of dialogue. Instead, the crime is conducted in near silence, allowing the minutia of the characters' actions to create a gradually building rhythm of tension that moves like clockwork. We watch as they slowly chip away at the ground, creating a hole beneath them leading into the room below, and then continue to observe as they painstakingly prepare the safe for cracking. All the while, the only sounds we hear are the clanking of metal, the soft breaking of concrete, and the calculated, heavy breaths of the thieves. The manner in which the sequence is cut together is simply masterful, drawing out the suspense just enough, making each tiny development in the task at hand utterly engaging. Helping to grip the audience further into the film's escalating narrative, is actor Jean Servais' no-nonsense portrayal of Tony. The weathered crook knows exactly what he is, but still sticks to a strict code of ethics all his own -- a certain type of "honor among thieves." And once his rules are disobeyed, the man has very little pity for those who break them. Smart, determined, genuinely intimidating, and cold as ice when he needs to be, Tony fits into a classic tough-guy noir archetype (complete with some unfortunate on-screen misogyny that hasn't aged very well), but the actor also reveals a clear soft spot, and this contrasting element of nobility and selflessness helps to keep him sympathetic. And beneath the film's solid characterizations, dramatic suspense, and gangster flick action, lies a surprising layer of morality. The script ultimately draws rather harsh criticisms on criminal behavior, and unlike many similar efforts, these thieves are not really romanticized. Despite some alluring scenes here and there, including a wonderfully atmospheric musical number set in a nightclub, and an occasionally playful sense of dark humor, this is a decidedly unglamorous look at the criminal underworld, revealing the lifestyle's heavy costs. One of the crime genre's truly defining classics, 'Rififi' is a pioneering heist flick that sizzles with understated style and utterly captivates with a slow building sense of tension and suspense. Focused on the intricacies and minutia of the thieves' robbery, and the harsh, unforgiving realities of their chosen profession, the film is a cynical, hard-boiled exercise in noir inspired thrills and violence. With a slightly heightened sense of arresting realism, Dassin creates an enduring work of motion picture art, easily stealing the adoration and devotion of countless movie buffs. 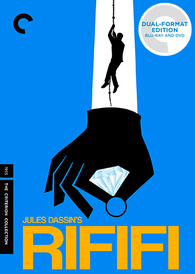 Criterion presents 'Rififi' in a Dual Format Blu-ray/DVD combo pack. A BD-50 Region A disc and single DVD come packaged in a clear keepcase with spine number 115. A booklet featuring an essay by critic J. Hoberman is also included. The movie is provided with a 1080p/AVC MPEG-4 transfer in the 1.37:1 aspect ratio. Nicely detailed and authentic, this is a very strong video presentation. Sourced from the original 35mm camera negative, the picture is in fantastic shape, with only some minor scratches and signs of wear visible in darker scenes. A light to moderate layer of grain is also retained, giving the image a natural, filmic appearance. Clarity is great, revealing fine patterns and textures in the characters' suits, and one can make out every bead of sweat on their faces during the tense heist sequence. With that said, the image can be comparatively soft in a few shots. Contrast is high with bright whites and solid blacks, and the grayscale is well balanced and natural throughout -- though, some negligible pulsing is evident here and there. Free from any major signs of damage or unnecessary digital processing, 'Rififi' comes to Blu-ray with a rather striking and respectful transfer that preserves the filmmakers' impressive visuals. The audio is presented in a French LPCM mono track along with an optional English Dolby Digital 1.0 dub. English subtitles are also provided. While the mix has some inherent limitations, the sound design is quite effective. Dialogue is relatively clear but speech is understandably thin and just a tad muffled in certain scenes. Though dynamic range is on the flat side, music and effects come through the single channel of audio well. 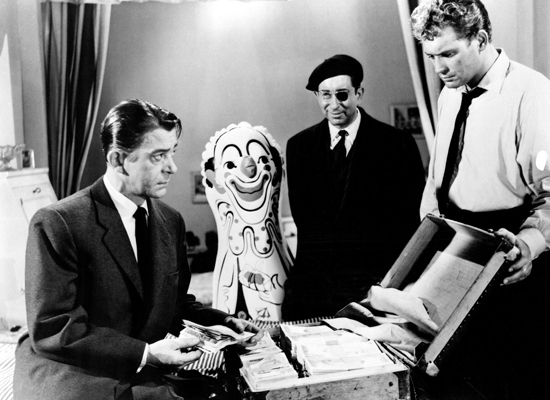 The "Rififi" musical number is particularly memorable, and key sound design choices during the famous heist sequence prove to be extremely effective, isolating certain sounds like breaking concrete and scraping metal to heighten the tension of the scene. Thankfully, there are no notable signs of hissing, crackle, or pops. With no major issues to report, the audio comes through quite well, leaving fans with a very solid track. Criterion has put together a small but worthwhile set of supplements. All of the special features are presented in upscaled 1080i with Dolby Digital 1.0 audio. Jules Dassin (HD, 29 min) - This is a comprehensive interview with the director recorded in 2000. Dassin offers some interesting facts about the film's production, his clashes with the producer, and shooting difficulties. He also shares a few fascinating insights on Hollywood and his first-hand experience with getting blacklisted in the 1950s. Stills Gallery (HD) - Presented in 1080p, this is a collection of stills and photographs along with a few set design sketches by production designer Alexandre Trauner. Trailer (HD, 3 min) - The film's trailer is included with English dub audio. 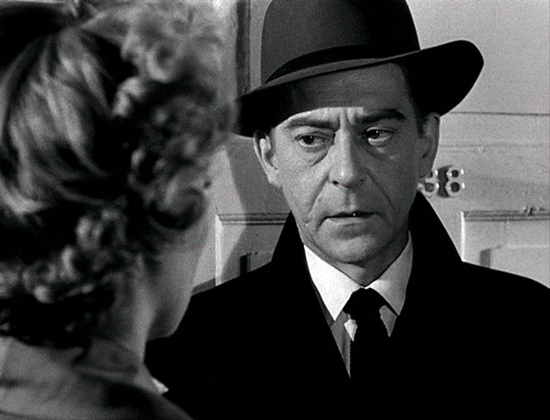 'Rififi' is a quintessential piece of crime drama filmmaking, laying the groundwork for all subsequent heist flicks. With its hard-boiled sensibilities, meticulous attention to detail, and slightly stylized sense of realism, the movie creates a palpable atmosphere of gradually building tension and intrigue. The video transfer is strong, and though limited by its age, the audio mix is also very effective. Supplements are a bit sparse, but the included interview with the director is full of great insights. This is a nice release for a fantastic film. Highly Recommended.